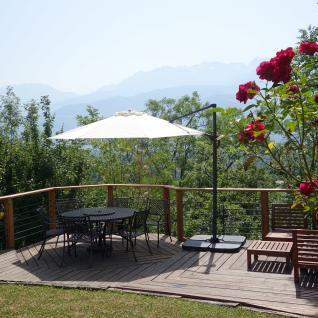 Ø 350cm octagonal cantilever parasol - Biscarosse - Grey - Cantilever parasol, tiltable, foldable and rotates 360°. 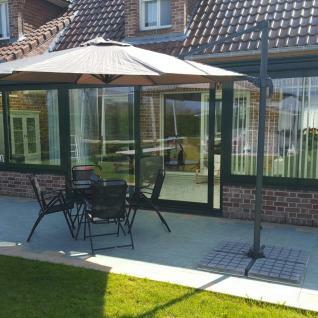 This premium quality cantilever parasol has a Ø350cm octagonal canopy. It is an indispensable accessory for your garden or terrace, as it offers superb protection from the sun. It can be handled easily thanks to its self-locking crank and its tilting handle and pedal of rotation. The Biscarosse has an awning at the top that allows air to flow and prevents the parasol from being caught by the wind. The vertical structure of this parasol is made of aluminium, which ensures durability over time and resistance to outdoor conditions A protective cover is included with the parasol. The polyester canopy (200 gr/m2) is coated with a water-repellent treatment which makes the canopy waterproof. Its cross-shaped base can be fixed to the ground or weighted down with a special base (not provided). The frame is made of aluminium, the ribs are steel, and the crank is plastic. Please note: the necessary base to weigh down the parasol is not provided. Click here to find a compatible base in our catalogue (fillable or resin). You can also find special concrete ballasts (from 40x40cm to 50x50cm) in large DIY stores. 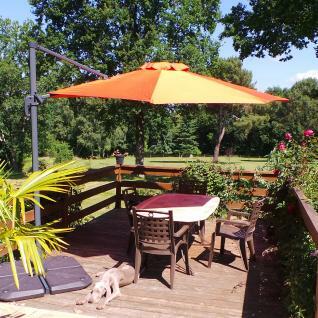 As per the design of cantilever parasols, this parasol does not resist well to extreme conditions or heavy rain. The colour of the parasol in the photo may vary depending on your screen's settings. We can provide fabric samples for each colour. Please feel free to request them when you visit our website.